Wikipedia is in danger. Google has just released a new project that aims to unseat the siempre_presente_en_todas_las_búsquedas: Wikipedia. The new project is called Knol (http://knol.google.com/) And it is in beta. And it is that Google does not want to be left behind in any of the fronts on which Internet progresses. 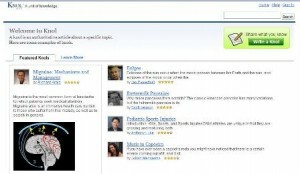 While already leading the search, free email, maps, calendars, etc .. and now wants to also lead the online dictionaries. Knol aims to be Google's response to the phenomenon Wikipedia. According to Google itself, the name comes from the word "knowledge" in English: "knowledge" and it will be a database of knowledge, self-feeding like Wikipedia, but with tighter control of the content published. One of the main differences between Knol and Wikipedia is that Knol articles will sign experts may include a photograph in their chips expert and will have a profile where the feedback of users of these authors appear. The structure of the articles, on the other hand, will not vary much from the Wikipedia offers.